*Weekly – use with caution. **Occasional and never – use with caution. ***Not applicable – use with caution. Occasionally, never, not applicable -numbers suppressed for mothers. Source: CICH graphic created using data adapted from Statistics Canada, Aboriginal Children’s Survey, 2006. http://www.statcan.gc.ca/pub/89-634-x/2008005/t/6000027-eng.htm -accessed August 27, 2017. 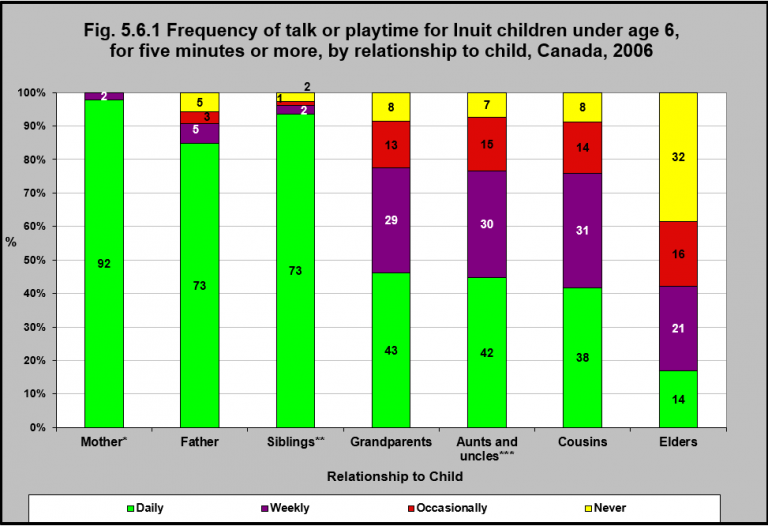 In 2006, 92% of Inuit children under age 6 talked or played together with their mother, focusing attention on each other for five minutes or more on a daily basis. That was the case with their fathers for 73% of the children. Seventy-two percent spent that time with their grandparents and their aunts and uncles on a daily or weekly basis. Fourteen percent of Inuit children under age 6 spent at least 5 minutes daily with their Elders. A further 21% did that weekly and 16% occasionally. 32% never had that kind of activity with their Elders. Indigenous cultures have traditionally valued kin, the interconnection of family, and non-family community members in the care and socialization of their children.1 There is also an abiding respect for Elders for their wisdom, spiritual leadership, and role they play in the sharing and preserving social values and beliefs, history, Indigenous knowledge and traditions. While family life has undergone enormous changes over the past 50 years in both Indigenous and non-Indigenous families in Canada, the importance of extended family to Indigenous peoples often stand in contrast to the more nuclear family focused perspectives of mainstream Canadian society.2 These differing perspectives must be taken into account in the design and adaptation of community services for Indigenous peoples.